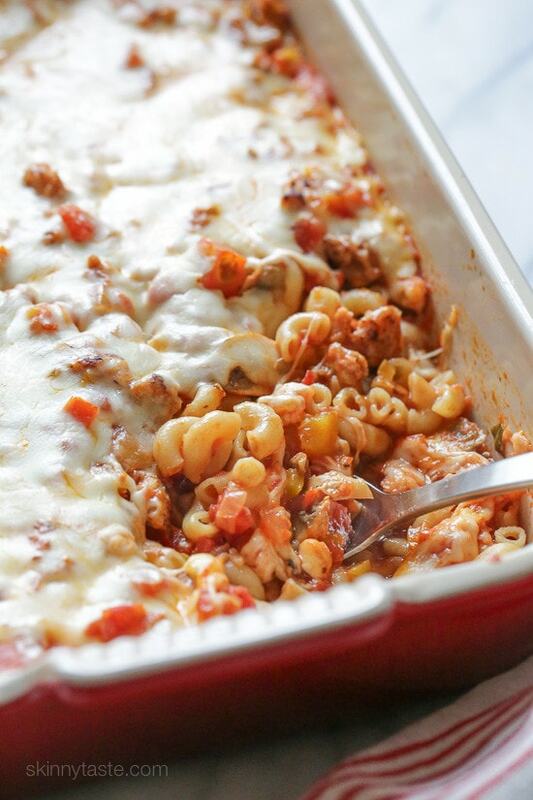 Chicken sausage, bell peppers, onions and mushrooms simmered in a marinara sauce then baked in the casserole with whole wheat macaroni topped with mozzarella. I love a baked pasta dish that doesn’t require having to cook the pasta, why dirty an extra pot? Instead, you pour the sauce over the macaroni and the pasta cooks in the sauce, right in the oven. Although this takes about 55 minutes to bake after you assemble, it’s unassisted cook time so you can go about relaxing while dinner’s in the oven. If you’ve been following me for a while, you probably know I swear by DeLallo’s whole wheat pasta, it’s the only whole wheat pasta I like and you can’t even tell it’s whole wheat in this dish (I swear). 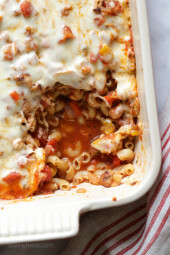 This dish was inspired by the Easy Macaroni Casserole I shared with turkey and veggies. Every time I make it I think, I bet this would be great with sausage and peppers and I was right! You could easily halve this recipe in a 9 x 9 baking dish to serve four. Leftovers can also be frozen. In a large deep non-stick skillet, brown the sausage over high heat until cooked through, seasoning with a pinch of salt and breaking it up into smaller pieces as it cooks. Set aside on a dish. Return the sausage to the skillet along with the remaining ingredients except for the pasta and cheese. 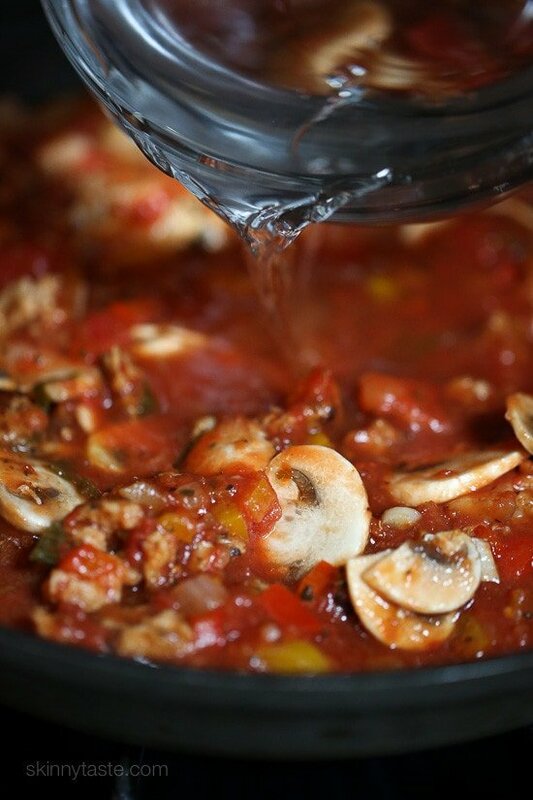 Bring to a boil and then lower heat to medium-low and simmer for 10 minutes, until the vegetables are soft. Spoon just enough of the sausage/vegetable mixture to cover the bottom of a 9×13 pan. Cover with uncooked pasta. 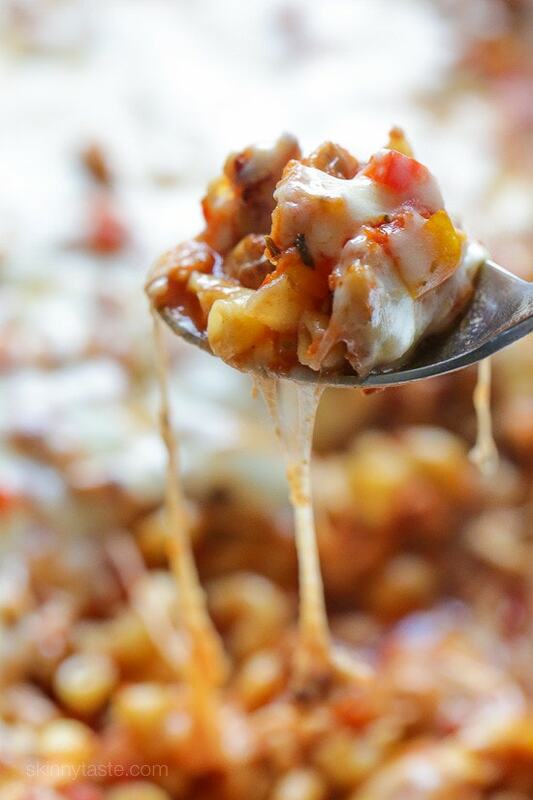 Spoon remaining sauce mixture evenly over the top and sprinkle with cheese. Cover with foil and bake 50-55 minutes. Remove from oven and let stand, covered, for 15 minutes. Disclosure: This post is sponsored by DeLallo. I only share products I use in my own kitchen. I created this recipe and received compensation to do so. This is SO good. It is also very, very, filling! I’m looking forward to eating it all week! I forget to get mushrooms, and I had to use turkey sausage. It was delicious. 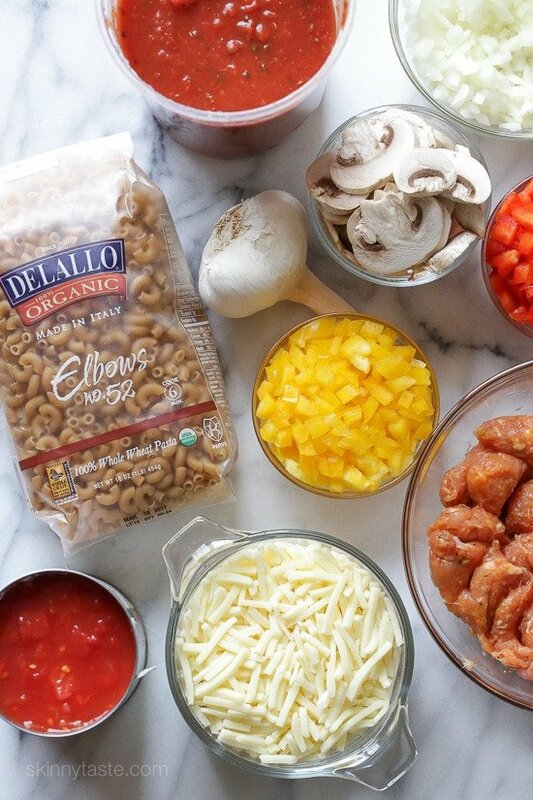 Can I substitute Delallo whole wheat fusilli pasta instead of maceroni noodles or will that affect the recipe/cooking process? I can find whole wheat maceroni noodles at my store. We tried this last night and my husband said it was amazing! It is probably going to go into a monthly rotation, especially now that it’s getting cold outside. I used DeLallo gluten free spiral pasta. The flavors were great but the pasta was pretty mushy and overall it was more like a soup because of all the liquid. I checked it at 30 min and the pasta seemed cooked so I figured it would just get more mushy if I left it in for the full 50 min but maybe that was my mistake. Def will try again and see if I can get the time right. The serving size is 1 & 1/4 cups correct? I made this tonight and we got 6 servings out of it at 1 & 1/4 cups each. This is DELICIOUS! I used turkey sausage because it was easier to find. I made it to freeze portions for lunches. So yummy! Am I the only one who ended up with way over-cooked pasta and a runny sauce? I cooked it according to the recipe… I like pasta cooked al dente – thoughts on how to make that happen? Just made this tonight for dinner…it was so good! The only change I made was to use oregano as the spice and added extra as that’s how I make my sausage and peppers. Gina, thank you so much for all you do! I use your recipes 4-5 nights a week (we have pizza night and leftover night(s) on the other days!) Keep posting your wonderful recipes! Cooking is fun and healthy again! I made this for my family last night! Everyone loved it!All 5 kids & my notoriously “I hate healthy food” husband! Will def make this again! I doubled the recipe & left out the mushrooms – we are not big mushroom eaters. I also only did one can of diced tomato. It was PERFECT! Well done! And only 8 SP! 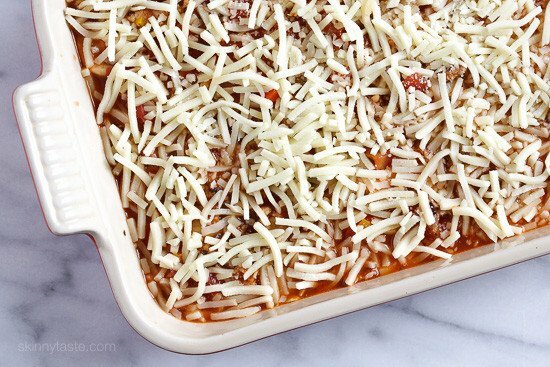 Has anyone assembled this a day ahead of time (minus the cheese) and baked the next day? Does it still have the right texture? Trying to make this as fool-proof as possible for my husband. I made this recipe tonight for my “picky-eater” husband. I didn’t have time to make my own marinara sauce, so I used store-bought. I also used turkey Italian sausage rather than chicken because that’s what was in my local grocery. I kept all the measurements the same as the recipe calls for. Phenomenal!! I almost halved the recipe in case my husband didn’t like it. Good thing I didn’t! Plenty of leftovers for tomorrow night, and then some to freeze. I was shocked at how well the pasta turned out. I have never put uncooked pasta in a casserole before. I have been on weight watchers for a couple of months and this was my first venture with a pasta dish since I started. The instructions were great and so were the results! Will be making this again. Thank you Kay! People who count calories I am sure want the calories including the veggies, which is why I do points in recipe builder… perhaps I need to add a disclaimer on each recipe for those who don’t understand. Could I cook this like your cheeseburger macaroni casserole instead? I would probably have to reduce the water right? Sure if you used cooked pasta reduce the water. Thank you! I did so and it came out absolutely delicious! Hi Karen – I was thinking of doing the same thing. How much water did you end up using? Thanks! Would you be able to cook this in a metal tin instead of glass dish? I want to make small portions to freeze and then give to my grandpa who lives alone. Thanks! Just made this tonight and everyone gobbled it up! Even the picky 3 and 6 year olds! I substituted plain ground chicken instead of sausage. I also added fresh chopped spinach and 1/2 tsp of red pepper flakes. I’m in Canada so I used Catelli Healthy Harvest Whole Wheat macaroni, which is readily available in our grocery stores. It’s also an excellent brand and you can’t tell its whole wheat. Thanks for all your great recipes! This looks amazing. Just wondering would you adjust the time for a buckwheat pasta that roughly takes 13 minutes to cook? Or do you think the same cooking time would apply? Just made this for the first time and really liked it!! how do you use the ground chicken? Brown it and add it when? It is actually chicken sausage not ground chicken. Brown it first. LOVE this! SO filling without being over the top. Added red pepper flakes for some kick, but otherwise followed the recipe. It was great comfort food! Even better the next day. Thanks Gina! Hi Gina – This looks delicious. I can't wait to try it out. I'll probably use gluten-free pasta. Do you think it'll be okay to skip out on the mushrooms? This was GREAT!! Very flavorful and filling. Even my somewhat picky 3 year old gobbled it up happily and asked for it for lunch the next day again! Yes, 8 oz is enough! The pasta swells and even with just 8 oz of pasta, one portion is a nice amount. This is really good! I made only minor changes, and my family loved it. For instance, I used 8.25oz pasta, only slightly less cheese, and subbed zucchini for the mushrooms, which I sauteed with the bell pepper. Yum!!! Dumb question but when do we add the water? it looks like its added after you add the veggies and the sausage together to the pot but I'm not sure. Anyone? Could you make this in crock pot? Could I make this and freeze to bake later? Would I bake it once and then rebake at time of serving? Thanks!! Love your site! Hi Gina! This was amazing and so easy for a weeknight dinner! Used spicy Italian chicken sausage, extra garlic, and added a small can of diced green chilies – we like extra kick in meals and it turned out perfect! Definitely making this again! Thanks so much Gina for all your recipes they have made me love to cook!! I made this last night and it was SO amazing! It was so easy and the flavors came together incredibly well. It was even better the next day for lunch! My husband, a long time whole wheat pasta hater, even commented on how great the macaroni noodles were! 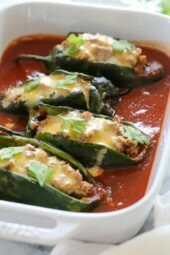 We both agreed this was our favorite Skinnytaste recipe of all time! Thanks! if you haven’t answered the freezing method would you mind sending it to me please. I want to cook half and freeze half. Freeze it after it is cooked. Weight Watcher does not count vegetables for points in recipes. She provides the actual calories as well but if you go by that you will not get an accurate points value because the calorie count includes the calories of the vegetables. Again veggies don't count in WW. I am surprised that so many WW followers don't know this?? THANK YOU! I know, I don't think WW is their job if people don't know this! The only accurate way to get smart points is via Weight Watchers recipe builder which is how I calculate since they do not count fruits and vegetables in recipes. Just made this tonight. I used sweet and hot turkey sausage and it was DIVINE!!!!! Everyone loved it. Yum yum. Made this last night minus the mushrooms. I'm the only one in the family that likes them so I omitted. It what so delicious. 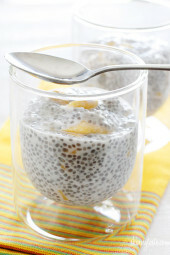 This recipe is amazing!!!! I made it tonight for my whole family. Especially for those of us searching for ww smartpoints friendly meals that are also filling and delicious, this one will be at the top of my list from now on. I felt like I was breaking my diet eating it. I love this blog! This is is to die for! OMG! I made mine with crazy winter-shaped pasta I had left over from another dish and I used seasoned diced tomatoes for added flavor. It is PERFECT!! Just added it to my recipe book. My son is going to LOVE it! Thank you!! When I try to pin this it only connects to the photo not the recipe, frustrated with Pinterest! So weird, going to look into this! This was crazy delicious. I added three cups of marina instead of diced tomatoes, 2 cups of chicken broth and half a cup of water, and 1.5 cups of pasta. Also removed the foil halfway through baking. Thanks for a great recipe Gina! 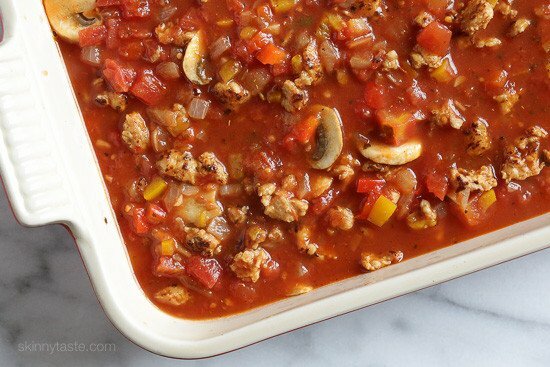 I made this today with Turkey Italian Sausage and it is to die for! Just what I've been craving! Perfect for lunches this week! I can't buy raw chicken sausage where we live, only the precooked packaged ones. 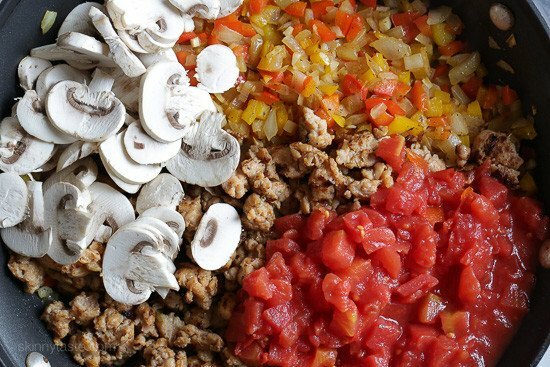 If I use ground chicken, what spices would you recommend adding? This looks yummy! Looks like something my family would really dig. I believe the explanation for the points difference is that the nutritional facts listed include all the veggies and smartpoints counts the veggies as 0. Gina, I made this tonight with Barilla whole wheat pasta since the DeLallo wasn't available in the store. I also used some local Fra Diavlo sauce and was afraid it would be too runny but it was great with some spice! This is a keeper!! 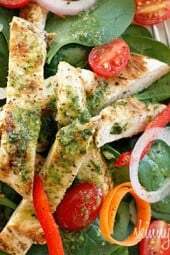 To all figuring points, I'd recommend putting your actual ingredients into the recipe builder WW provides. My ingredients yielded a 9 points per serving. We'll have this again for sure! Awesome! That's because of the sauce you used, if you use my homemade marinara with crushed red pepper flakes it would be 8 smart points via WW recipe builder. I experienced the same thing with this recipe and one other. It keeps me from being able to use the "quick add" feature, so I enter the information into the calculator before I head to the grocery store in case the points are too high. I love Gina's recipes, so it's worth the extra effort. I got 11 SP as well, based on the nutrition information provided. Hi Gina! My first post EVER on a website. Luv your recipes THAT much! Stupid q, grocery mozz cheese is 8oz but measures 2 cups. I used the whole package tonight & it was amazing… But did I ruin the 'skinny' element?! Thanks for your response. Love your cookbook… Use website/ book every night!! Thank you! Weight is the most accurate so I think you're ok! Just made this in my pressure cooker, one pot cleanup. Delicious as always!!! Thank you Gina! Did you use pasta, too, or did the squash replace the pasta? Thank you for posting this! I’m not a fan of mushrooms and wanted to make sure if I substituted squash it would hold up being baked that long. Can’t wait to try this slightly modified recipe! I used the weight watchers calculator and It comes up as 11 smart points. Can you explain the discrepancy with the points? I love Skinny Taste recipes but the difference in the points concerns me. I really wish WW would post something this, you should ask you leader. The only accurate way to get points is via Weight Watchers recipe builder which is how I calculate ALL my recipes since they do not count fruits and vegetables in recipes. If you use their new calculator many recipes will be higher than they should be because vegetables have calories! I used my WW hand held calculator and it came up 11SP. The only accurate way to get points is via Weight Watchers recipe builder which is how I calculate since they do not count fruits and vegetables in recipes. If you use their new calculator many recipes will be higher than they should be if you calculate it yourself on the Weight Watchers site. I built it in the recipe builder and have come up with 10 pts consistently. Even using different brands of pasta and marinara. I'd err on the side of caution when using someone else's points. Oh yummy, this looks so great! This looks great but when I plug the nutritional information into my WW smart phone app, it comes up with 11 smart points value. I was just going to ask the same thing. I got 11 smart points. Why the discrepancy? Same here. But when I put the entire recipe into recipe builder it came up as 7 SP. Yes, thank you Shi!! The only accurate way to get smart points is via Weight Watchers recipe builder which is how I calculate since they do not count fruits and vegetables in recipes. Bless you, Gina! I'm adjusting to the new WW program, and a dish like this with Smart Points calculated (and a reasonable number!) that looks so delicious and freezes well for leftovers is just what I need! I'll be making this over the weekend. Thank you! 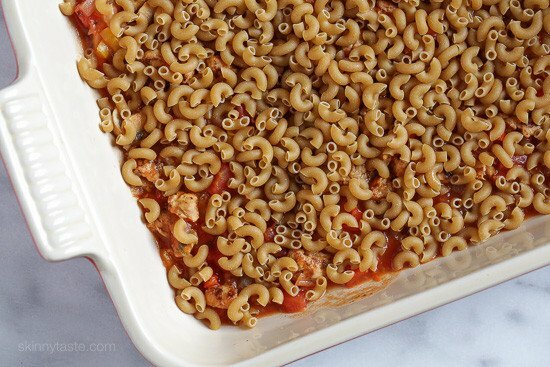 This seems similar to the Macaroni Casserole which is a family favorite! Is the taste different? Do you think "noodles" can be used in place of pasta or would it be too mushy? Thank you. yummy!! Cant't wait to eat it. Made this for dinner tonight and it was amazing! I used one sweet Italian chicken sausage and one hot Italian chicken sausage and it was just the right amount of heat. I had very happy bellies all around the table tonight. Thanks! I would like to know that question too, and I think I'll try it since hubby likes just something similiar. If you cook this with gluten free pasta will it still work to bake it dry? Will gluten free pasta get mushy? I made this with gluten free organic lentil quinoa pasta. It came out great. Also used shitake mushrooms and added fresh grape tomatos. Delish. Made this today. I only had hot italian sausage which I cooked, drained and rinsed to remove the fat. I used low fat italian blend cheese. Turned out pretty good. I think I would add some crushed red pepper flakes next time for a little kick. Tks for the tip, I printed it out just know and I'll just use regular sausage. What could I substitute in place of the mushrooms? 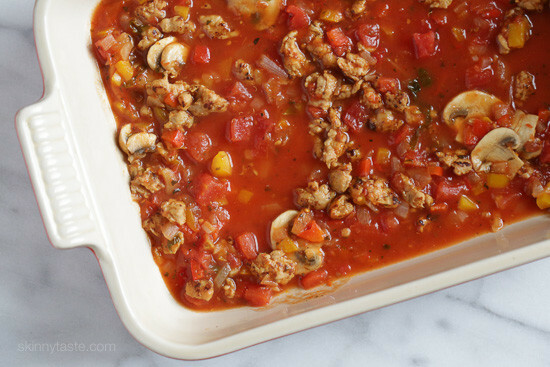 You can use just plain ground chicken and add your own spices to it. Is chicken sausage required or could I use regular sausage? I have used turkey italian sausage in place of chicken italian sausage in other of Gina's recipes. You can use regular sausage but it will effect the calories and points. Can't wait to make this!!! You had me drooling over your snapchat yesterday. What chicken sausage do you use? I've seen that ingredient in several recipes of yours but can never seem to find it at the store. I've used the turkey sausage which works just fine but would love to try it with the chicken sausage. Thanks! I'm in Texas and there are quite a few Sprouts around! I'll take a look. Thanks! I'm also in Texas and Krogers has them in the meat case by seafood. Sprouts also sells the chicken sausage without the casing. Saving the time of having to take it out! Costco also carries chicken sausage.